Atlanta indie-punks worlds greatest dad have been around for a few years, and after picking up buzz around their local scene, they caught the attention of Wrecking Ball ATL founders Greg Green and Elena de Soto, who booked them on last year’s Small Ball and signed them to their label Deep Rest Records. 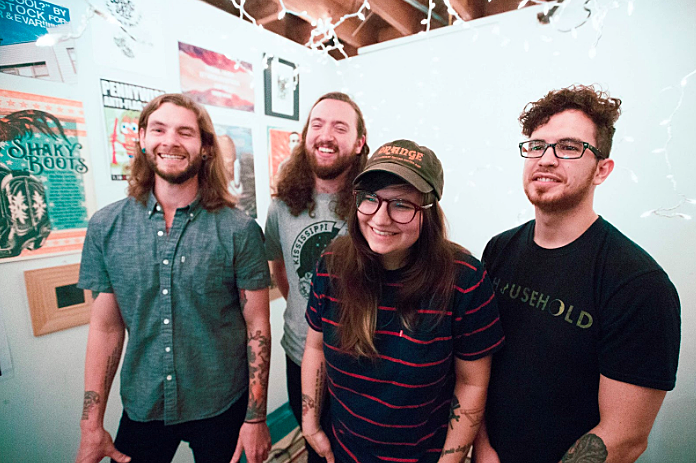 worlds greatest dad are releasing their debut album get well soon on May 11 via that label (pre-order), and we’re premiering a new song from that album, “cough,” along with its video. The premise of the video is that worlds greatest dad “went around Atlanta with a photobooth, taking pictures of strangers and asking them what they want the world to know,” and the result is a series of clips with the strangers’ photos and quotes. “cough” follows previous singles “laughing (while you’re smiling)” and “a song for mogis,” all three of which make get well soon seem like a pretty promising record. There’s a little ’90s alternative rock, a little modern-day emo and more in the mix, and singer Maddie Duncan really knows how to hit you right in the feels. Check out all three singles below. The day before the album comes out, worlds greatest dad will open their hometown stop of the Wonder Years / Tigers Jaw / Tiny Moving Parts / Worriers tour, and after that, they’ll go on a tour of their own. They play Long Island’s Amityville Music Hall on May 30 (tickets) and they have a TBA Brooklyn show on June 2. Stay tuned for more info on that show. All dates are listed below.